We are living longer and so are our cats. This is due to improvements in the control of infectious diseases and diet. In the USA this is also due to the gradual increase in the number of full-time indoor cats, which seems to be the accepted modus operandi in cat caretaking in that country. A possible downside to full-time indoor living is less activity. Less activity might mean becoming overweight and that can lead to health issues such as diabetes. In 2002 it was thought that 30% of domestic cats were "at least 6 years old" and about 30% were aged 11 and older. Although there is some debate about this, in and around the 1970s the cat food manufacturers decided that older cats have specific dietary requirements. This is based on the argument that a specialized diet can improve the cat's quality of life and help prevent the onset of disease associated with old age. Which brings me on to the slightly knotty question of, "when is a cat an old cat?" Personally, I am astonished at the views of some "experts" who say that a cat is old when over the age of 7! This assessment may have been made for commercial reasons; meaning the assessment is not objective. Older cats are meant to need more veterinary treatment and check ups etc. - a good sales point for veterinarians. I am sorry if that sounds a bit too cynical. Oh, and cat food manufacturers can introduce a new range of cat food for "the older cat". Commerce is always there somewhere. Drs Carlson and Giffin of Cat Owner's Home Veterinary Handbook, Fully Revised and Updated say that the "average house cat now lives 15 years". You can see a comparison between human and cat age. They say that the period of old age is relatively short compared to the central period of their life, adulthood. Anyway, in my considered view an old cat should be one that is over about 14 years of age and geriatric cat care can commence around that age. Many cats these days (2010) live up to and beyond 18 - 20 years of age provided they are well cared for. Moggies, random bred cats, generally live longer than purebreds due to better "genetic health". In the USA experts consider cats of between 9 and 12 years of age and beyond as old cats. Clearly, this is an individual cat thing. Some cats are very sprightly at 15 years of age. Although because cats sleep a lot when adult and before becoming old, the change in food intake is less pronounced than for dogs. Loss of efficiency of nutrient digestion, particularly the digestion of fat, decreases slightly in older cats. Cats can eat more to compensate. This can be managed by cat caretakers in providing more food that is also more palatable and easily digestible while monitoring weight. Senior cat food manufactured commercial should address this requirement. The loss of smell as indicated below can be compensated by highly palatable cat food - cats judge food on its smell. Adding small amounts of fat can aid palatability. This applies to cats who are under-eating of course! Human food treats that can be digested by cats can help: microwaved fish with some water added, white chicken meat and boiled egg and cottage cheese are suitable say Drs Carlson and Giffin. Apparently, geriatric cat food falls into two broad categories (a) lower fat content with decreased calorific density to that of maintenance food and (b) food formulated for older cats who have weight loss and loss of body condition. Geriatric cat care should include the provision of "optimum levels of high quality protein" to minimize loss of lean body tissue and to provide essential amino acids. The absorption of vitamins may also diminish with age. Vitamin B is lost in the urine of cats "with reduced kidney function", so geriatric cat food contains added vitamin B and minerals. If feeding cat food manufactured for older cats vitamin supplements are not indicated. Kidney disease is not uncommon in geriatric cats. Low magnesium cat food (new window) should be considered for cats with FUS (Feline Urologic Syndrome). 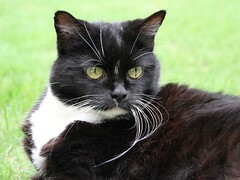 These include the appearance of white hairs on the muzzle and shoulder more often, a lowering of the condition of the coat, a decrease in the effectiveness of the cat's senses especially hearing and eyesight, a decrease in activity and the possible onset of arthritis causing less agility and mobility. A loss of muscle tone can be felt and seen in an old cat. Stiffness is also obviously very apparent. One thing that we might not spot if the cat goes to the toilet outside is constipation or diarrhea. Cleaning a litter box has its advantages as it allows us to check on health! 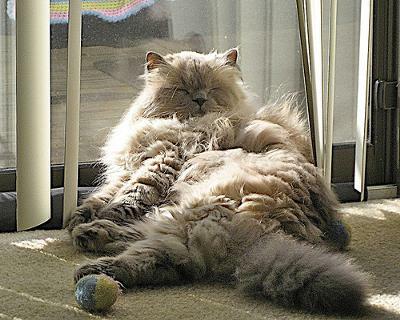 Constipation is "one of the most common problems in older cats" (Drs Carlson and Giffin). This is due to lack of exercise, being static, reduced bowel movement and muscle weakness. Diet may also play a role and drinking less. Failing to defecate is important but failing to urinate is an emergency. Diarrhea can be a sign of cancer, pancreatic disease or malabsorption syndrome. See treating cat diarrhea and home treatment for cat constipation. If you would like to read more, I cover this area in more detail here: Changes in Older Cats. Diet can help in "relieving symptoms or slowing the progression" of some disorders such as diabetes mellitus. Do we as humans change our diet when we get older? Sometimes if we have specific health requirements we do but in general we do not. This might guide us in respect of our cat's diet. The age a cat lives to is dependent on the care it receives. Accidents, diseases, lack of food, stresses and multiple and frequent pregnancies shorten life. Vets suggest that cats over the age of 7 have a yearly check up. Personally I don't necessarily go along with this. The veterinary exam includes and an analysis of the urine, stool and blood. Older cats are obviously more sedentary seeking warm quiet spots to sleep the day away. Mine actually likes to sleep under a bush outside in the warm weather. Older cats show signs of being cranky just like people. Older cats can become almost invisible in a sense, which can encourage people to ignore them. The exact opposite is required. Plenty of TLC and play is best. My old lady is not a good boarder so I don't leave her at a cat boarding home when I go away. I either don't go away or have someone care for her at home. This allows for her routines. Boarding can be stressful for a cat. It can bring on feline urinary problems such as cystitis. Older cats can suddenly start to become underweight. Loss of appetite or weight in the geriatric cat can be a danger signal and a warning to take urgent action. Of course an assessment is made against the cat's general behavior, routines. If a cat is a regular eater and stops the warning is obvious. Elderly cat health problems (there will be some natural overlap with this article). Thanks for an excellent article. Most useful.